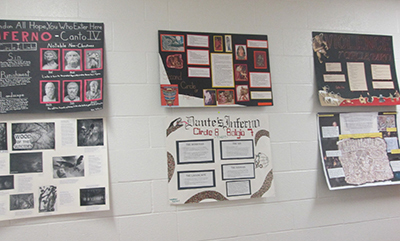 Students in Dr. Todd Williams’ ENG 101 class created poster presentations depicting one of the circles of hell in Dante’s Inferno. The project asks students to think creatively about the sins and punishments within their chosen circle while also explaining and analyzing what Dante was expressing in his text. Students were graded on creativity, design quality, and literary analysis. The posters also serve as a model for academic poster presentations to prepare students for conferences and other presentation opportunities. The final projects are currently on display in Lytle Hall outside of LY 130.